Posted in response to the Daily Post weekly photo challenge. This weeks theme ‘Creepy’. One for any fellow Dr Who fans! I’ve been watching Dr Who since it began in 1963 (good grief, am I old or what…). I’ve seen all the various incarnations of the Dr, liked some, haven’t liked others (most recently loved both David Tennant, and Matt Smith’s versions). Been irritated by pretty much all of his companions (except perhaps Jamie (played by Frazer Hines) who I had a bit of a crush on when I was thirteen, despite him being a bit thick). I’ve been freaked out by many of the baddies, and amused by some of the more rickety others – particularly by the Cybermen when they were updated and had quite groovy bell bottom legs. 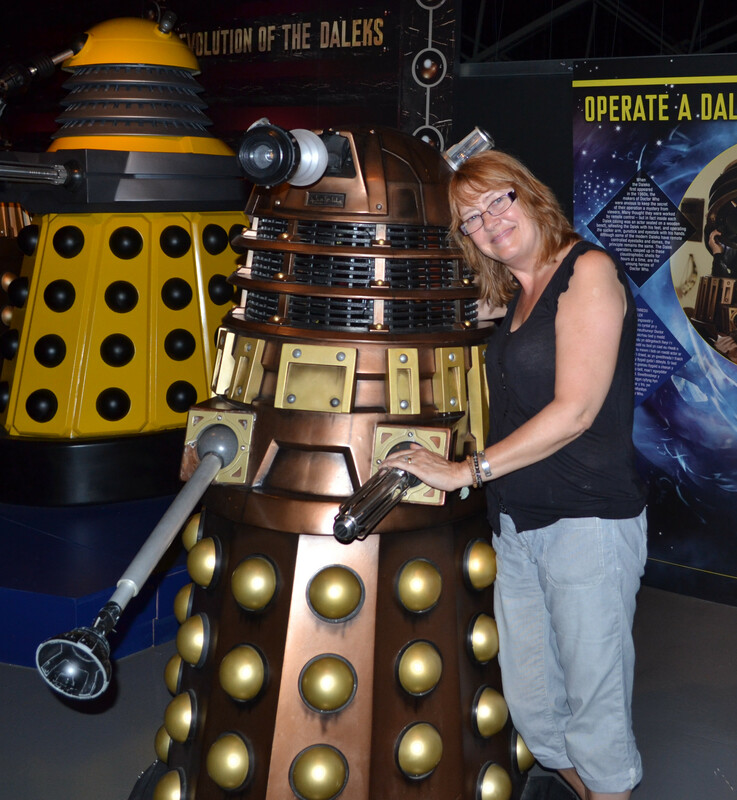 Of course, the Daleks , are the most iconic of the Dr’s foes, with their beady eyes,robotic voices, sink plungers and egg whisks (that’s me in the picture having a bit of a moment with one of the ol’ fellers), but honestly, they are cutie pies compared to the ‘Weeping Angels’. If you’ve not come across them, beware! When observed they stand still and rigid, much like any beautiful stone angel you might come across, but blink, just once, just for a millisecond, and they will lunge toward you. One touch of their icy finger can send you back in time, while they feast on your energy…. brrr….. sends shivers down my spine just thinking about them. I guess on paper they don’t sound that terrifying, but trust me, watch them on TV on Saturday evening, and they’ll freeze your blood. This entry was posted in Photo Challenges, Ramblings and tagged Cardiff, cybermen, daleks, Dr Who, Photo Challenge, photography, weeping angels. Bookmark the permalink. Oh I agree. 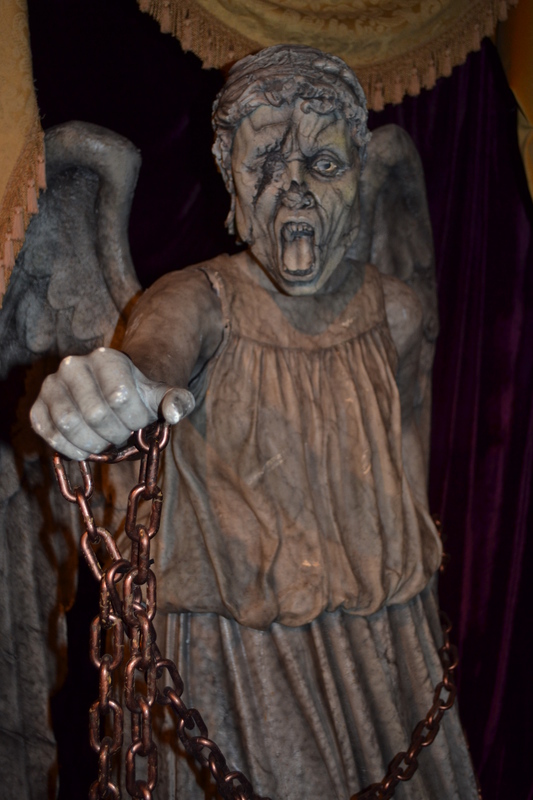 the Weeping Angels really creep me out! I watch a lot of SciFi, this was the BEST scifi episode of any show ever written. Don’t. Blink. Yep, I agree. It was really spine tingling scary!